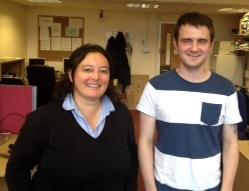 Welcome to Iris Buunk and John Mowbray, new research students within the Centre for Social Informatics at Edinburgh Napier University. I am the Director of Studies for both students. Iris Buunk holds a Masters degree in Information Sciences awarded jointly by the Haute École de Gestion in Geneva, Switzerland and the École de bibliothéconomie et des sciences de l’information (EBSI) at the Université de Montréal in Canada. Since 1999 she has worked as an information professional in several public sector institutions including: the University of Geneva as a Trainer-Librarian; the Swiss-French National Radio as a research assistant on an FP6 European project that focused on audio semantic search; and more recently the University of Lausanne as an Information Literacy Project Coordinator. Iris has also been an adult trainer for several years in the fields of social media, e-reputation, information literacy, and advanced information search. Iris’ research at Edinburgh Napier University will explore the impact of social media tools on tacit knowledge sharing practices between employees within public sector organisations. Iris’ second supervisor within the Centre for Social Informatics is Dr Colin Smith. John Mowbray has just been awarded an MSc in Information and Library Studies with distinction by Strathclyde University. John’s work experience includes employment in food retail, accountancy, and information services. John’s doctoral study at Edinburgh Napier University is concerned with the evolution of social networking, and its impact on career management skills. As existing research in this area focuses largely on off-line networks, particular attention will be paid to social media as tools for networking, and their potential use for job searching and career development amongst the workforce in Scotland. As an exploration of information behaviour and use within the context of employment research, this work will provide a theoretical insight into how information is deployed and disseminated in social networks supported by social media for both social and economic benefit. Professor Robert Raeside, Director of the Employment Research Institute at Edinburgh Napier University, is John’s second supervisor. John’s research is funded by an ESRC studentship offered through the Scottish Graduate School of Social Science with the support of Skills Development Scotland. This entry was posted in PhDs, Teaching and tagged Centre for Social Informatics, Colin Smith, Edinburgh Napier University, Iris Buunk. John Mowbray, knowledge management, Robert Raeside, Scottish Graduate School of Social Science, Skills Development Scotland, social media, social networking by Hazel Hall. Bookmark the permalink. I am Christofhar from India, a LIS professional. I congratulate both Iris and John, wish them all the best for their research work.